Deep red, good intensity. Clean and fruity. Supple and aromatic. The harvest is manual. The vinification is carried out in stainless steel tanks. The wine is aged in oak barrels (35% new) for 18 to 20 months. The assembly is subject to a strict selection, the worst vintages are used in the second wine "Lagrave-Martillac". The collage is made with egg whites. The wine is designed to age, tended to be a bit daunting in its first five years, but this fault has now been largely erased. 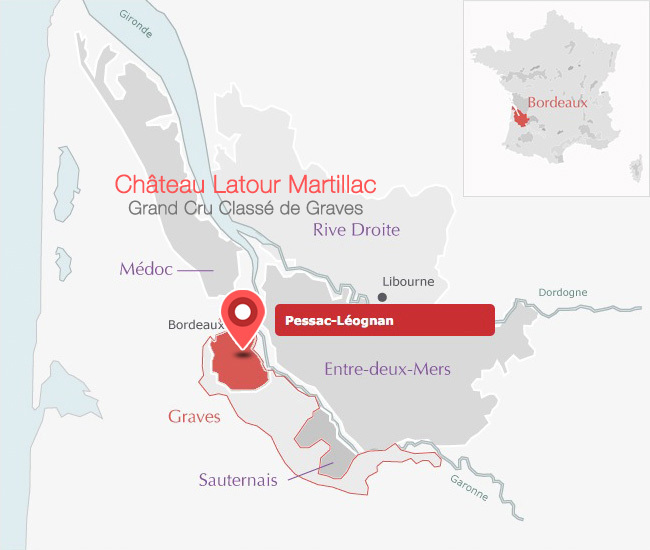 Right, elegant, red-Latour Martillac has a high purity of fruit with a nice freshness. The wine always has a good density but without heaviness. Annual production is around 150,000 bottles. The AOC Pessac-Leognan has been a relatively new Appellation, since in 1987. However, it has an ancient terroir that dates from the Middle Ages. Located on the southern edge, southwest of Bordeaux, the Appellation includes all major Graves Crus, including legendary Château Haut-Brion. It produces a lot of red wine (67 000 hl / year 1300 ha) and some dry white wines (15 000 hl / year of 265 ha). This terroir composes of gravel, pebbles, sand and clay. Soil allows red grape vines such as cabernet-sauvignon, merlot, cabernet franc, petit verdot and malbec and white grape vines such as sauvignon and Semillon, to have a typical expression. It is this combination that gives her unique style to the wines of Pessac-Léognan. The mouth of the Red Pessac-Léognan is fleshy, balanced, with tight tannins, it finishes with notes of ripe red fruits and licorice. As concentrated as complex, white wine has its strong personality with its fat and smooth side, its great freshness and good balance.